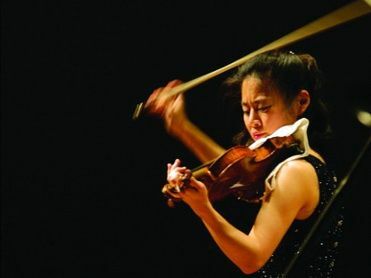 Playing Paganini and Sarasate as a teen with such prestigious conductors like Zubin Mehta and Leonard Bernstein, Midori’s technical mastery is, as always, beyond dispute. Indeed Midori, turning 40 this year, is amongst the few child prodigies who can continue to shine glamorously under the cruel spotlight. On Sunday evening, one more time, she conquered the audience by her technical assurance and musical solemnity. The curtain of the concert was raised by Beethoven’s First Violin Sonata. Midori and Abramovic adopted a rather classical approach to this Beethoven’s first ever output of the genre – crispy articulation, exquisite phrasing, as well as super-refined details throughout. Under a comfortable pace without compromising Beethoven’s trademark compelling drive, the outer movements were rendered with beguiling sense of light and shade. But it was the second movement that was enlivened by some truly enchanting charm and imagination. Hardly a variation went by without Midori bringing to the surface both the music’s lyricism and sense of humour. Ensuing was a UK premier work composed by Brett Dean and dedicated to Midori through which the composer expressed reminiscence of his Berlin life. The tuning of the violin was altered by the G string lowering a whole tone to F for the sake of unique colouristic effect; and it was the imaginative tonal sonority that formed the sine qua non throughout the five movements. The beginning of the second movement, played on the tuned down F string, was imbued with particular sorrow and darkness. Great care of details on sonority was also tellingly exemplified in the following movement in which the pianist played on an upright piano with moderator (a layer of cotton between the hammers and strings) and the violin with a practice mute, foreshadowing the acoustics of practice room. One minor reservation about this otherwise commendable account was the lack of an emotional climax throughout the five-movement piece. I would have welcomed more visceral excitement at the transformation from the opening chromatic glissando to the chordal passage at the middle of the last movement. Notwithstanding, it was an engrossing reading of an enthralling composition. The pleasant experience in the first half somehow overshadowed the monotonal second – Abramovic’s cosmetic tonal clarity soon became tiresome and boring. The Schubert Sonatina, in which the piano played a crucial role, came across as a plainspoken discourse under the pianist’s monochromatic tone colour in spite of Midori’s tip-toe delicacy. In the Franck Violin Sonata, whose meaning is predicated mostly in its harmonic language, what was missing was the kaleidoscopic colour of harmony and orchestral sonority from the piano. Thanks however to Midori’s wonderfully felicitous inflections of dynamics and phrasing that brought to life each musical note on the score. It is commonplace that a performing musician finds his/her summit at the 40s and 50s of age. Let us anticipate with lofty expectation that Midori will endlessly bestow upon the audience consummate sound of music in the coming future.